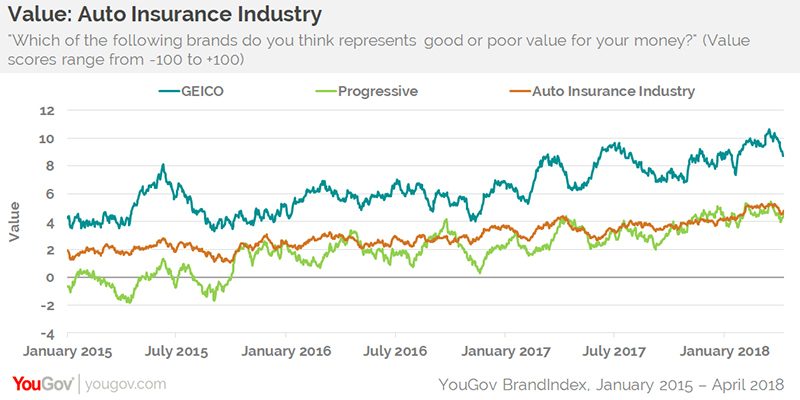 Advertising awareness has been on a long-term decline with GEICO, Progressive, and auto insurance companies as a whole since the beginning of 2015. Yet, this downward marketing trend doesn’t seem to be impacting other key perception metrics, which have actually been on the rise, according to YouGov BrandIndex. In 2017, GEICO boosted its ad spending by 4% on an annual basis to an estimated $1.52 billion, according to S&P Global Market Intelligence. During the same year, Progressive raised their ad expenditures by 32% year over year to an estimated $910.8 million. GEICO, which leads the auto insurance sector, has seen its ad awareness fall from 55% of adults saying they’ve seen an ad from them in the past two weeks on January 1, 2015 to a current percentage of 48%. Progressive has gone from 45% to 38% over the same time frame, and the auto insurance sector average fell from 31% to 26%. GEICO’s Word Of Mouth increased minimally over the past three years while Progressive essentially remained flat. 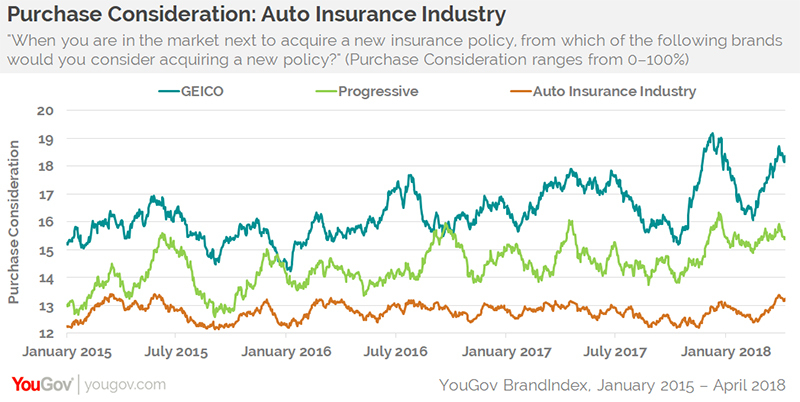 But it doesn’t seem to have negatively affected other metrics: GEICO and Progressive saw increases in Purchase Consideration, a key metric of potential revenue, with both companies coming in above the auto sector average. Three other important YouGov BrandIndex metrics rose in distinct patterns: Value, Quality, and Impression. In each case, GEICO tracked around the industry average or just above it, while Progressive trailed the average. With Ad Awareness going down and Word Of Mouth barely moving, what is driving all these other metrics up? It is possible that the quirky GEICO and Progressive ads have become so ubiquitous that they may have become “part of the wallpaper.” Even when there is a surge of ad buys, consumers may be tuning them out because they’re used to their tone and pitches. The key may be the very distinct rise in Value scores for both brands. Consumers generally want the best deal, so with that message coming through loud and clear in the marketing – GEICO’s Value numbers have been particularly positive – it may be the bottom line that is luring them in.